A succession of companies used the Woodbridge, Connecticut match factory, founded in 1835. The first to use private die stamps was Frank E. Clark (F.E.C. ), son of the man whose portrait is on all of the Woodbridge stamps, founder William A. Clarke. The F.E.C. stamps were issued from May, 1870 through March, 1872. 5,367,820 were issued on old paper and 2,779,680 on silk paper. The one shown was printed on silk paper. F.B. Brockett and Frederick Newton ran the Woodbridge factory for about a year. 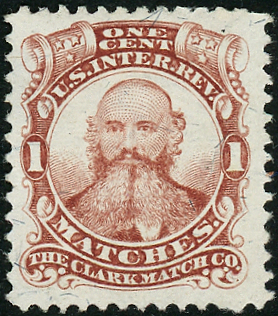 They had the initials at the bottom of the stamp changed to B&N, and this version was printed for three years, long after the Clark Match Company had assumed ownership. There were two dies - Die 1 with larger initials than Die 2. Stamps were issued fromApril, 1872 through July, 1875. 11,770,000 were issued on silk paper. Die 1, shown above, is less common. 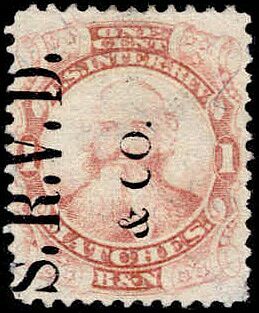 The SRVD cancellation is from S. R. Van Duzer, a druggist in New York who also had their own patent medicines. 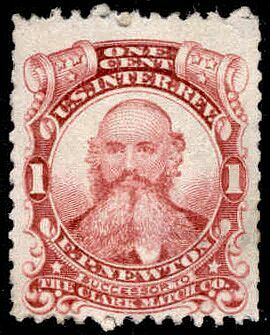 A Die 2 stamp of Brockett and Newton. 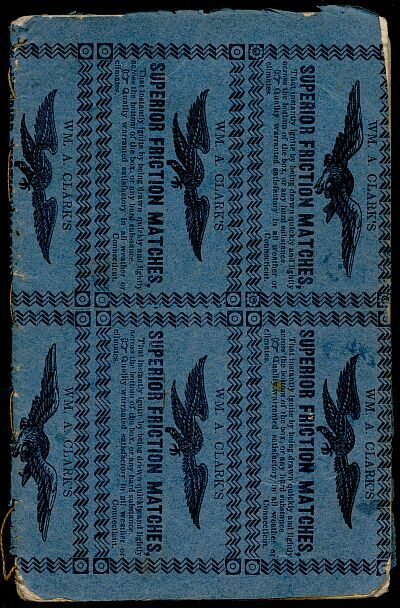 These stamps were often cut apart in strips for ease in application to the packages of matches. 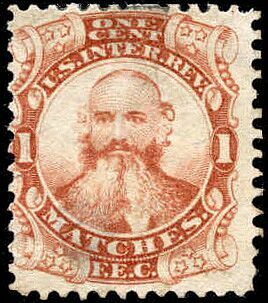 The Clark Match Company assumed ownership from Brockett & Newton in December of 1872, but did not have the die changed to reflect their name until the National Bank Note Company began to print the stamps in 1876. 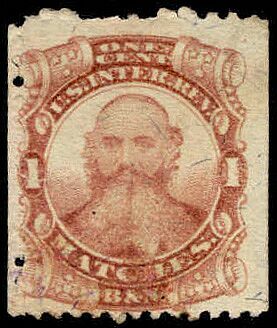 Their stamps were issued from March of 1876 through June of 1877. 5,322,000 were printed, on silk paper. Frederick P. Newton, brother-in-law of Frank Clark, ran the company from 1877 until the Diamond Match Company bought the factory in 1883. Newton had the stamp die altered to insert his name and a very small legend, "Successor to" under it. These stamps were issued from August of 1877 through mid-March of 1883. 26,317,000 were issued on silk, pink and watermarked papers. The copy above was printed on watermarked paper. A book of inspirational poetry for children with a cover made from an uncut sheet of Clark match labels.